Two years of research have resulted in the development of the 11K, a deep-water submersible rated to 11,000 meet and weighing a mere 60 kilograms. 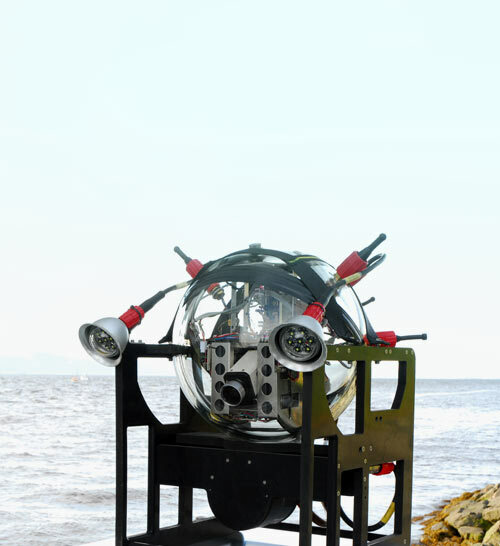 The most distinctive component of the vehicle is the glass sphere that contains much of recording equipment and was made by Nautilus Marine Service GmbH (Bremen, Germany). It is a 1-atmosphere electronics pressure vessel that also provides bouyancy for the vehicle. The sphere is held in place by an external frame made from thermoplastics, which also surround the other external components such as thrusters, pressure sensor, lights and drop-weight systems. The drop-weights system was designed and developed by Promare with the capacity to release weights in three stages: one descent weight, which is dropped just above or on the seafloor; several small weights, which can be dropped to obtain neutral buoyancy on the seafloor; and an ascent weight at the end of the dive. In addition to propriety software and hardware (which was used in the glass sphere), an assortment of off-the-shelf components were used as well. These include a high-definition video camera and lithium-ion battery pack from OceanServer Technology, Inc. (Fall River, Massachusetts). In addition, the system includes a high-resolution, full-ocean-depth pressure sensor custom-made by Presens AS (Oslo, Norway) and full-ocean-depth LED lights. The Ocean Server lithium-ion battery pack containing approximately 760 watt-hours of energy powers the dimmable LED lights (which are housed in small glass spheres) as well as the rest of the vehicle. A power-control function allowing for long passive periods with minimal battery drain makes abyssal dives with long ascent and descents possible. A single-board computer controls all vehicle functions. In AUV mode, the system is preprogrammed and the computer controls the vehicle completely, while HD video is stored on board. In ROV mode, the vehicle is controlled via a fiber-optic connection custom made by Teledyne Impulse-PDM Ltd. (Alton, England); it provides two channels of communication. One channel is a 1-gigabit-per-second network for operator commands and sensor measurements, and the other provides real-time high-definition video signals. The system incorporates full-ocean-depth thrusters customized by Tecnadyne (San Diego, California). There is also an independent and dedicated GPS and Iridium circuitry on board fro NAL Research Corp. (Manassas, Virginia). This system acquires a position fix that is transmitted to the vehicle operators as soon as the vehicle surfaces for easy relocation. These various parts resulted in a low-cost, easy-to-deploy robotic vehicle system that allows for an increased exploration tempo in the deepest parts of the worlds oceans.